Get the life saving information you need to know about the huge dog food recall. 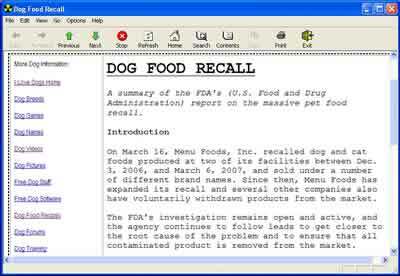 This Dog Food Recall software has vital information on the huge dog food recall of 2007 including: What Dog Foods Have Been Recalled? Which Dog Foods Are Safe? What Is The FDA (U.S. Food and Drug Administration) Doing About It? Dog Food Recall News & Updates and How To Report A Complaint If Your Dog Gets Ill.
Get the life saving information you need to know about the huge dog food recall. Get the life saving information you need to know about the huge cat food recall. Catfood Mail is a tool for POP3 mailbox administration. Makes counting anything food related much easier. Qweas is providing links to Dog Food Recall Dog Food 1.1 as a courtesy, and makes no representations regarding Dog Food Recall or any other applications or any information related thereto. Any questions, complaints or claims regarding this application Dog Food Recall Dog Food 1.1 must be directed to the appropriate software vendor. You may click the publisher link of Dog Food Recall on the top of this page to get more details about the vendor.